Out of Hawaii's 1.2 million residents — 370,000 are concentrated in urban Honolulu. It was near Waikiki that Kamehameha the Great (see statue in 5th photo down) began a decisive battle in his campaign to unite the Hawaiian Islands for the first time, defeating the forces of Kalanikupule — then the high chief of Maui and Oahu — in the spring of 1795. Also in Honolulu, a coalition of sugar planters and missionary descendants would overthrow the Hawaiian Monarchy in 1893. After Statehood was declared in 1959, Honolulu became the state capitol. And in 2007, I visited. Top photo is Honolulu and Waikiki as seen from the top of Diamondhead. Breathtaking. 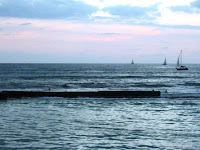 To the left is a common scene at Waikiki. Surfers everywhere. Waikiki, to me, was like Myrtle Beach. Tons of souvenir stores opposite the beachfront. Touristy, crowded, kitshy stores, but the beach side was spectacular at dusk. 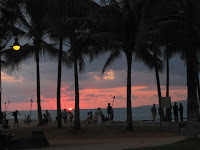 Waikiki is an absolute must see place as sunset. We caught sunset there twice in one week. This sea wall separates the swimming area from the boating and surfing area. I still don't know why the surfers didn't crash into the seawall, it's a mystery. We landed at the Honolulu airport around 5 in the evening, which was 11:00 our time, so we were rather tired. But Andrew, in his great wisdom, took us straight to Waikiki for sunset. 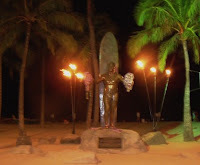 torch lighting ceremony at Kuhi’o Beach Park next to the bronze statue and banyan tree --- VERY COOL. Stumbled upon it our first night and even saw some Polynesian dances, like a luau, right there on the beach at sunset. Nothing could be more ideal than that. Our first few minutes in Hawaii and we saw all that, how perfect! And while you're in Waikiki, you must go to Lulu's for dinner. It has open-air seating and excellent food. This is the view from my seat as I dine on my last evening in Hawaii. My first and last evenings were at Waikiki, that should tell you something. A luau. Of course. That is the next thing on everyone's mind when you plan a trip to Hawaii. The second thing would be the Brady Bunch's luau and then you might think: "no, let's skip the luau." But don't skip it. It's crazy. It's fake. It's touristy. But, seriously, if you go to Hawaii, you HAVE to do a luau. There are several options. We chose Paradise Cove. The food was very good, buffet. The evening wasn't rushed, we were there for hours. The sunset there was also good. And the Polynesian shows were great.... AND interactive - watch out. Prior to dinner, we went from one area to another to experience local culture. They had basket weaving, sword fishing, lei making, etc. on display and you could participate as well. 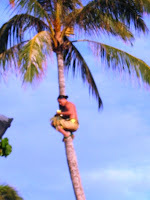 Pictured here is a local showing us how they used to gather coconuts. So you could just sip on drinks and walk around for an hour before dinner was served. It was nice, beautiful weather, and right on the beach. On your first trip to Hawaii, don't miss a luau. Also, going out of Honolulu, are the whale watching cruises. Another "must do" if you are there at the right time. We were there at the end of the whale season, the very end, so we only saw one whale. There she is -- a beaut. But the cruise itself was outstanding. We got to make our own leis during the cruise and we saw some excellent dancers, had great food and relaxed on the lounge chairs on the deck. Another "must do" for your trip to Hawaii. 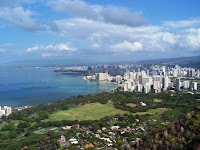 Here's Diamond Head in the bottom right of the photo while the city center of Honolulu is behind, in the top of the photo. 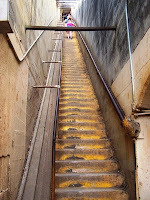 The Diamond Head hike is worth it for the incredible 360 degree views of Waikiki and the turquoise blue Pacific Ocean. The hike is long; the weather, hot. Take a bottle of water. Take flip flops to put on after the hike & get your sweaty socks and sneakers off quickly. Wear sneakers for the hike, for sure. After you've hiked up and up and up & don't think you can take another step, you find yourself at the wrong end of 97 steps. When you're at the lowest of all low feelings, just remember: I told you it's worth it. In addition to Honlulu and Waikiki, you must also go by the Halona Blowhole, drive along the Halona coast and snorkel in Hanauma Bay (my favorite part of the entire trip). Links below. Enjoy your trip! Thanks for the pictoral and narrative journey because I know I'll never get there but hey as long as you keep traveling we'll see the world on here, where next?